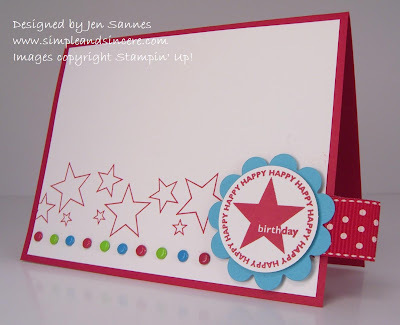 I used my Starring You stamp set to create the star border and the birthday star embellishment. To create the line of brads, I used my Mat Pack with the piercing guide for perfect placement - easy peasy! This would make a quick and simple children's birthday card - I love the bright and cheery colors (Real Red, Tempting Turquoise, Green Galore and Whisper White). This is such a fun, eye-catching card! I'm new to your blog and loving it! !